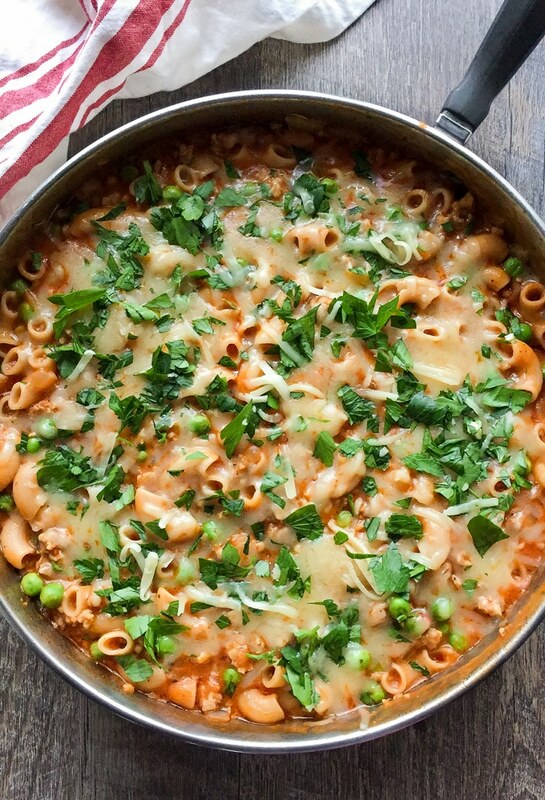 Super flavorful and cheesy , this Italian Sausage Pasta is a one-pot meal that your whole family will love. That’s right. The pasta cooks right in the sauce! Such an incredibly delicious and easy weeknight meal. Today’s recipe is one of my favorite type of dishes. An Italian sausage pasta dish! It’s so gloriously cheesy and creamy! Deliciously easy to make and can be on your dinner table in about thirty-five minutes tops. Plus, you only have to clean up one pan and a lid! This One-Pot Italian Sausage Pasta really is just about as easy to make as some of those boxed pasta meals you probably ate growing up. Even if you use pre-shredded cheese for this, you still come out better nutrition-wise. When you cook from scratch, you get to control the ingredients. That means you can avoid those nasty ingredients that are in processed foods. Better yet, get the kids involved! Let them shred the cheese while you work on the rest. It’s a great way for them to start learning some cooking skills. Plus, they can feel a sense of accomplishment for helping get dinner on the table. 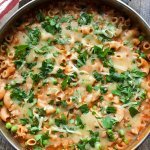 If you’re looking for another tasty one-pot meal, my One Pot Mexican Macaroni Skillet is a super tasty option! Super flavorful and delicious, this Italian Sausage Pasta is a one-pot meal that your whole family will love! Heat oil in a 10.5-inch skillet that has a lid over medium-high heat. Add sausage, breaking it up with a spoon as it browns, about 5-6 minutes. Add the onion and continue to cook until vegetables have softened, about 5 minutes. Stir in the red pepper flakes, oregano, Italian seasoning, garlic powder and stir until the meat mixture is fully coated. Stir in water, tomato sauce and pasta. Reduce heat, cover and let cook, stirring occasionally, until pasta is tender, about 15-20 minutes. Cook time may vary depending on brand and type of pasta, so check for doneness often starting at the 15 minute mark. Turn off the heat. Add the peas and one cup of the cheese and gently stir to combine. Season to taste with sea salt, top with remaining cheese and parsley, then serve. 1.The salt content of sausage can vary, so keep this in mind when adding salt. 2.It's very important that you stir occasionally so that the pasta doesn't stick. 3.Ingredients vary from brand to brand of chicken sausage. I use pasture-raised chicken sausage from my butcher, which doesn't have nutrition info. The estimates below were based on Whole Foods 365 Everyday Value Italian Chicken Sausage. By Tempie at February 24, 2018 .